1. Make the batter according to the method given on the uthpam mix. 2. Chop all vegetables very fine. Mix them together if you want. 2. Heat the griddle/tava. Not too hot, sprinkle few drops of oil & then some water drops to cool off. Using a paper napkin/thin cloth, spread it out. Pour 2-3 Tbs of batter & spread it evenly in circular form. Sprinkle some chopped vegetables as shown. (This one is without carrots & coriander. You can add if you like) Drizzle with oil on sides & little over the uthpam. 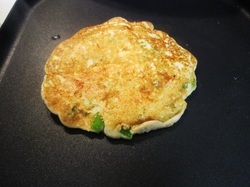 After few min, slowly scrape off from sides with a flat spatula, & turn it over. Drizzle some more oil on sides & let it cook. Press with the spatula in between till its done underneath. 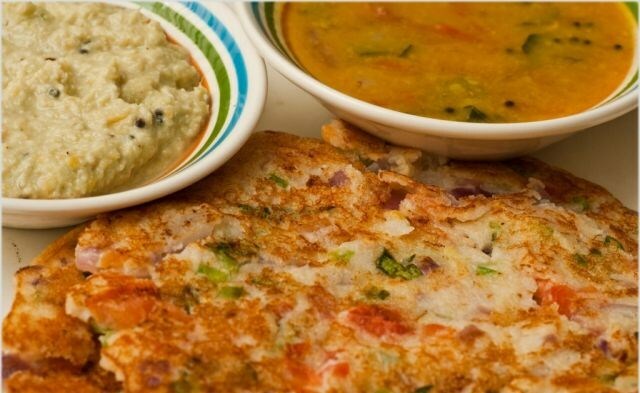 Serve hot with coriander chutney or sambhar (Indian arhar/toor dal) or both. 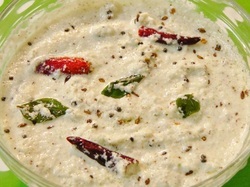 Click on the pic to see the recipe for coconut chutney. No need to soak dal or grind. 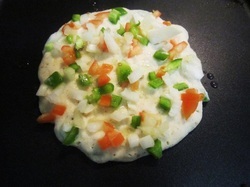 Just use the ready-made powder & prepare your toppings just like pizza! !